"I once remember Wayne Hemingway - founder of Red OR Dead, general good egg and fashion sooth-sayer - saying that his fashion maxim was to take a look at what the average household was throwing out (i.e. Gran's old nick-naks) and salvaging them because what the average person considered old fashioned was just about ready to make a HUGE comeback in the eyes of the fashionistas". Hmmm..... Wise word by guru Wayne. We, at Ceramic Fusion are deeply excited by these moves toward re-incarnating lovely old vintage china, and are currently desiging some ranges of product to go into this wonderful new area. 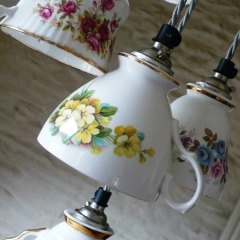 Lovely old pieces of vintage china can be beautifully transformed by the new art of recycling, aptly named 'Upcycling'. Melody Rose originates from Canada, but works from her North London studios. 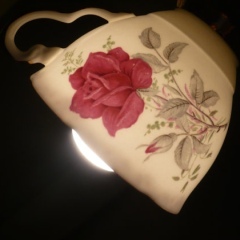 To us, she is the leading light of recycling vintage china. She is having fun with her juxtapositions, but at the same time has a cultured approach to her range aesthetic, working with leading quality Staffordshire makers as she does. We love Betty Raspberry because she doesn't do that, she just does what she does and what she does is innocently ingenious and totally spontaneous. Betty's influences are old black and white films, vintage songs, and nostalgia. 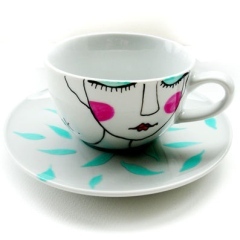 Although her cups are hand drawn, they are safe to use. 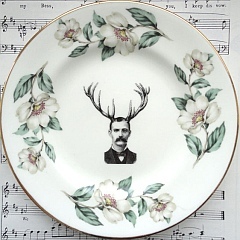 The Dapper Stag collection is one we are putting together with Bournemouth artist Laura Mulliner. It will be a Ceramic Fusion collection backstamp. 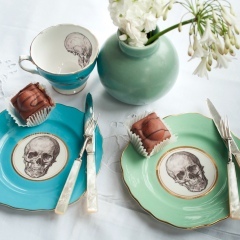 The Re-Work House is the genius behind the bone china lamps and many other beautiful and intriguing ideas. The collection puts us in mind of a genius magpie who not only collects all manner of things, but also puts them together in unimaginatively imaginative ways. The Beach Shack Project is one of our most favourite of all artistic endeavours. The simple genius of seeking and finding washed up shards of venerable china and glass that nature, the elements and the sea has sculpted into soft natural shapes is worthy enough. 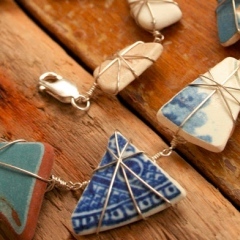 Then using exacting jewellery-making skills to re-present them as a beautiful fresh art is simply a wonderful thing. We can't think of anything more diametrically opposed to mass-produced stuff from the Far East sweat-shops than the meticulousness of the Beach Shack Project.